A 1929 Ford Tri-Motor airplane sits on the tarmac at the Mid-Valley Airport on Thursday, April 12, 2018, in Weslaco. 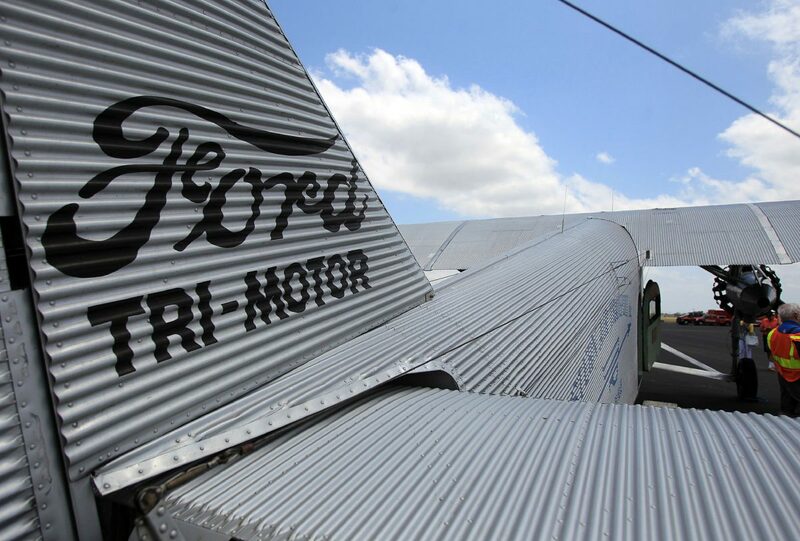 WESLACO — From Oshkosh, Wisconsin, one of the eight Ford Tri-Motors remaining in flight-worthy condition has made its way to the Weslaco Mid-Valley Airport for the chance to “experience the golden age of aviation” with a flight aboard. Experimental Aviation Association member and volunteer Bill Thacker, who has 46 years of aircraft experience, is here from Central Illinois for his “days off” piloting for United Airlines to give air tours on the “Tin Goose” through Sunday. One of the perks of the plane featuring nine-passenger seats in a single file, said Thacker, is whether you prefer an aisle or window seat, “you get both.” Air conditioning and heat are dependent on the weather; the windows are adjustable. It is, however, fully equipped for safety with life-vests and a fire extinguisher, discouraging passengers from smoking. The EAA is an organization of aviation enthusiasts with 210,000 members nationwide and 900 chapters. The local chapter was established in the late ’70s and is composed of about 30 individuals — namely retirees. Membership can fluctuate seasonally with visitors such as Winter Texans, according to Cindy Vasquez, secretary for Rio Grande Valley EAA Chapter 595. Members meet on a monthly basis in different locations, often airports, throughout the Rio Grande Valley to discuss their passion for recreational aircraft. 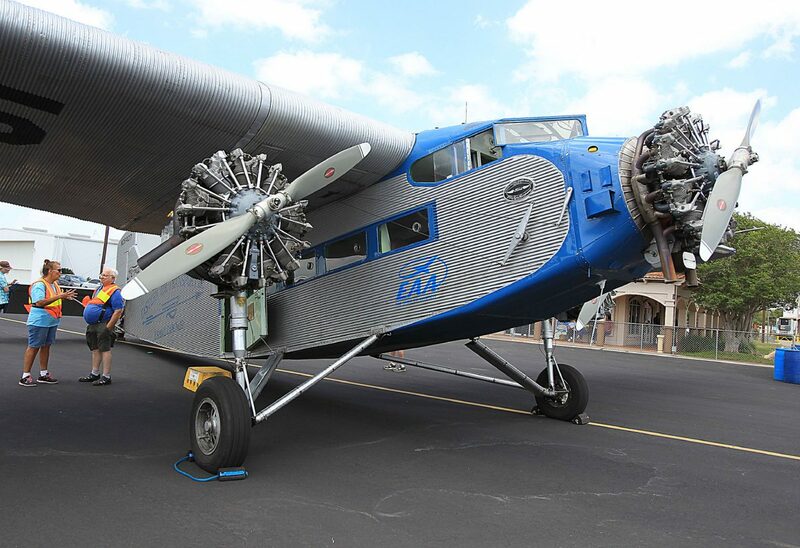 Efforts put forth by the officers led to the visit of the Tri-Motor. “It’s a piece of flying history,” said Vasquez, who first became a member of the EAA in the 1980s. A clear view of Weslaco neighborhoods, pools, parks, churches and stadiums are a few of the sights to be taken in during the 15 to 20 minutes spent up in the air. Production for this model began in 1925. In 1929, the visiting glider was the 146th of 199 off the assembly line. It was designed by Henry Ford and built by William Stout as the first ever mass-produced commercial airliner. It was marketed to reach “coast to coast in 48 hours” and is capable to fly 240 miles before stopping for gas. Ground travel during this period would have taken 10 days, according to Thacker. Other makes of the Ford aircraft have been flown by Amelia Earhart and President Franklin D. Roosevelt and Charles Lindbergh, whose celebrity status at the time Thacker said trumped that of Bono today. Following an accident during a show ride, the vehicle spent 12 years inactive before its restoration. Since being purchased by the EAA, approximately 400 hours of flight have been added each year, said Thacker. Its wingspan measures 78 feet; it can travel at a top speed of 132 mph and has been safety inspected a number of times to ensure being “tour-ready,” said Vasquez. Vasquez, as well as some of the other members from the local chapter will be present all weekend to assist with operations. Other uses throughout its nearly 80 years spent in flight include crop dusting, aerial firefighting and the inauguration of air service between Havana and Santiago de Cuba. In later years, its three engines were replaced and it became the most powerful Model 4-AT ever flown, with a combined total of 1,450 units of horse power. One purpose of this event, said Vasquez, is to expose a younger audience to such a hobby and encourage them to get involved so they may “keep the torch lit,” for the RGV Chapter. Tickets for the air tour can be purchased for $75 at the location, or in advance for $70; children 17 and under pay $50. For more information, visit eaa.com.